RideMax: But What About Spontaneity!?? 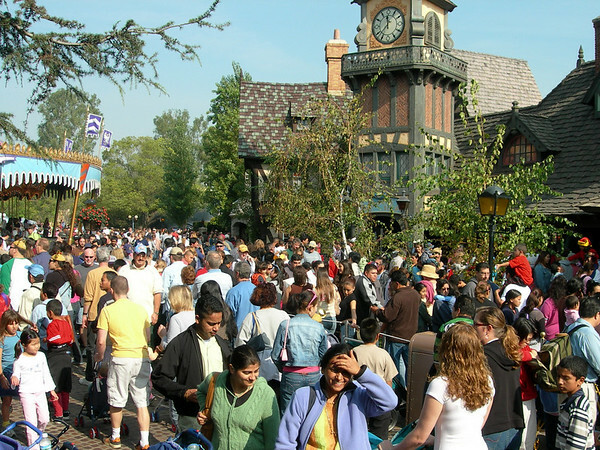 A busy scene at Disneyland. How far will spontaneity get you in crowds like this? Well, there certainly are seasons of the year when you can have your cake and eat it too (the week after Labor Day in September comes to mind). When the Magic Kingdom has a posted wait for Space Mountain of just ten minutes in the middle of the afternoon, why NOT be spontaneous and just enjoy the park? The problem is, these dates are uncrowded for a reason — it normally just won’t work to take the kids out of school in early September, when school has just begun. So for most folks, the alternative is to visit when the park is more crowded: spring break, the summer, fall break in October, Thanksgiving, Christmas week, or some other school holiday period. The question you have to ask yourself is, how much fun will you really have if you’re “spontaneously” moving from one HUGE line to another? Will your kids REALLY appreciate the fact that they were able to be “sponaneous,” when they just finished waiting 40 minutes for Dumbo, followed by an hour waiting for Space Mountain? I just wanted to write about our wonderful experience with RideMax on my recent trip to Disneyland to my two boys, ages five and eight. A number of my friends laughed at me because I’m such a ‘planner’ and they thought I was overdoing it, but it was the best plan ever! The boys and I were there when the gates opened and started following the plan. The rides that we were directed to first thing in the morning were so empty that we rode some of them twice in the time Ride Max had planned for us. We had finished eight rides by 9:00 in the morning! That’s unheard of! We walked by people waiting in hour long lines with our FastPasses and never waited more than ten minutes all day! We also loved the location recommended for the parade viewing! We did absolutely everything we wanted to do in one day…and then some. Now, I’m not going to guarantee that everyone using a RideMax plan will wait less than ten minutes for everything — that’s probably unrealistic. But even if the RideMax plan helps keep you away from just ONE of those hour-long lines, isn’t that worth sacrificing just a BIT of spontaneity for? I agree about the long lines. How can you be spontaneous in an hour long line with 4 kids? It’s usually with the fighting, whining and “I’m hot, cold, thirsty, or gotta go potty”. We spend so much time and money planning a trip to Disneyland, why ruin it by standing in long lines all day? We usually have two days that we stick to “the plan” and the third day we meander around the park taking our time, people watching, stopping to find hidden Mickey’s or taking a second look at those window shop writings. That way we get our “cake” and eat “it” too! :0) Let’s spontaneously create a Ridemax plan and stick to it! We learned about spontaneity the first time we used Ride Max. We spontaneously decided to wait in line for Roger Rabbit in the afternoon. A good 45 miserable minutes in line and my son had to go to the bathroom…..love spontaneity! (yes, we even knew about the Fast Pass- not my idea:). We are still spontaneous, even with Ride Max- the plan is a guide. No matter how much planning is done, you have to allow for spontanaiety or the trip is no fun. I think the plan actually gives you more time for spontaneity since it allows you to get in all that you want to do without miserable waits. There is still time left to wander aimlessly and feel really good about not being one of those people at the end of that huge line. i am trying to find out if i need to carry a laptop in to disneyland and can i change my rides during the day . thanks your help would be great . We have used RideMex three times now and each time we have LOVED using it. I can’t imagine doing the parks any other way. Some friends bought it and took the schedules to the park. They sheepishly admitted to us later that, whenever they decided to go “spontaneous” and ignore their plan, their wait times increased dramatically. Be spontaneous in planning, when you get there follow your plan and enjoy short lines and spending time enjoying the rides and shows. This application rocks! BTW, I used in on a Mac without any issues. I definitely don’t enjoy spontaneity if it means waiting 50 minutes or more! I can’t think of how bad it would be if I DIDN’T have a plan! Previous Previous post: Disneyland in Mid-October: Scary Crowds?! !